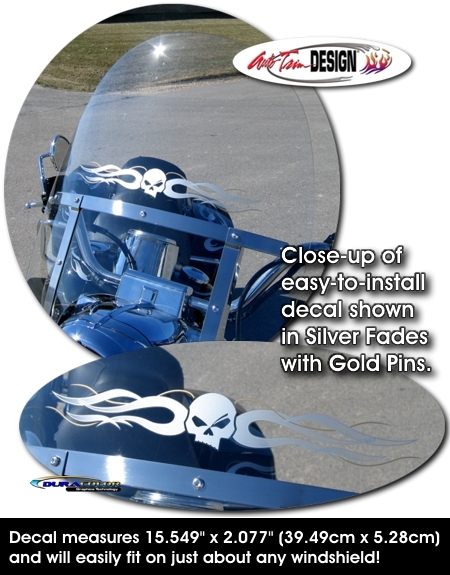 Detail your bike's windshield with this awesome Skull & Flames Graphics Windshield decal kit. Available in ten (10) different color combinations, this precut easy-to-install decal uniquely fades from solid at the flame base to a light fade at the tips of the flames with a fine pinstripe highlight in a different color uniquely weaving in and out of the flames. While the decal is fit and shown here on the Harley-Davidson Softail Detachable King-Size Windshield as shown, it can be used on other size windshields as well. Decal is set for installation on the inside of the windshield for maximum protection, however it can also be installed on the outside of smoked/tinted windshields (Skull will be reversed). Includes easy-to-follow general online instructions. Set you bike apart from the rest today!